Wash the chicken breast and pat them dry and then slice it into one inch cubes. Now place the chicken into a clean bowl and add a marinade comprised of 1 tablespoon water, 1 tablespoon soy sauce, and 2 tablespoons cornstarch. Mix this with the chicken thoroughly. Set this aside at for about thirty minutes to fully marinate the chicken. While the chicken is marinating, you can make your sauce. Mix together the vinegar, rice wine, soya sauce, sugar, sesame oil, and cornstarch. Mix it well and set it aside. Heat oil for deep frying in a wok, when hot enough fry the cashew nuts until they are golden brown. This will take a few minutes as you don't want the oil too hot so you don't burn the cashews. So once you are have reached a golden brown colour, strain the cashews. In the same oil, fry the marinated chicken pieces and fry about half of them at a time. Stir constantly because there is cornstarch with the chicken and they will stitch to one another. When the chicken is golden brown, remove them with the slotted spoon and keep aside. In another wok, heat about one tablespoon of oil, when the oil is hot enough start by add the dried red chillies and the Szechuan peppers. Stir fry briefly until they turn dark. Frying these chilies gives a wonderful flavour to the Kung pao dish. Now add the grated ginger and sauté for few seconds. When the chillies have turned dark, add the fried chicken and cashews and sauté foe few seconds. Stir your sauce ingredients around making sure there is no clumps of cornstarch in there. Add your sauce and stir fry for few seconds on high heat. Turn of the heat. 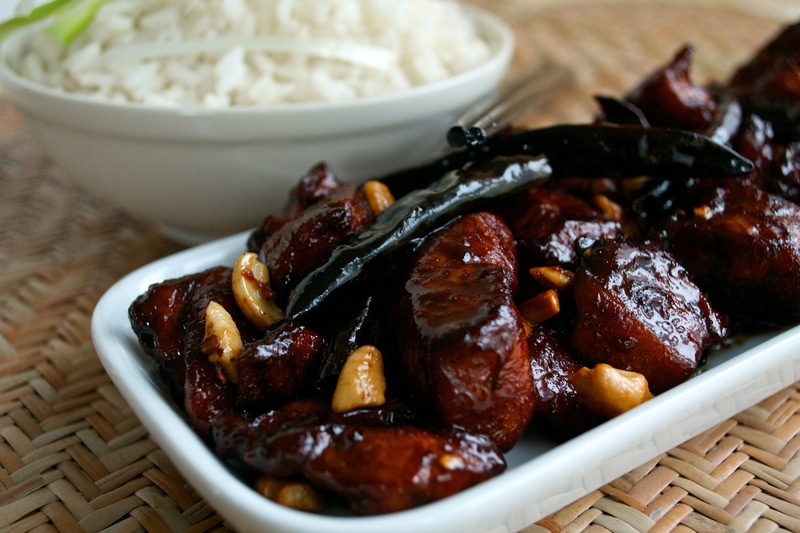 Your Kung Pao Chicken is ready. Enjoy it with steamed rice or egg fried rice. 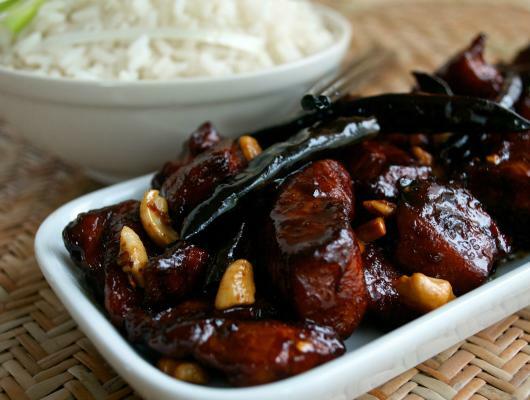 A very easy, simple and delicious Chinese dish which tickles your tastebuds.